Fresh & Saltwater Aquarium Supplies. 2x MAXSPECT ETHEREAL 130W LED AQUARIUM LIGHT MASTER WITH One CONTROLLER ICV6. MAXSPECT ETHEREAL 130W LED AQUARIUM LIGHT MASTER - MARINE REEF AQUARIUM LIGHT. We have 5 units available for sale. They are all master units and will need a ICV6 controller to be able to use the App. Without the controller you can control the units with the turn dial on the light itself. Comes with light, Ballast, power cords, mounting bracket and I also have the original boxes. The Maxspect Ethereal 130w LED Light Slave can either be used as a stand alone light (with minimal control) or controlled with the Maxspect ICV6 Controller and the iOS/Android app for advanced control. We also carry the ICV6 Controller and the Ethereal together as the Maxspect Ethereal 130w + ICV6 LED Light Bundle Package. One ICV6 Controller can control up to 200 Ethereal lights. Covers a 24" x 24" area with corals or 30" x 30" for a fish-only aquarium. 5 programmable color channels plus integrated dawn to dusk, photo-period profiles, weather modes plus many more enhancing features. 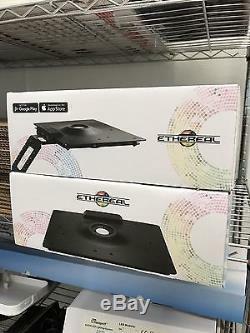 Programmable RGB color LED fan for aesthetic back-light effect. Advanced crossflow fan draws air from above and below the fixture. The fan automatically turns on at 95 degrees. Main body of light is 10.5" front to back X 11.5" wide. Includes stylish tank-top mounting arm. Optimized 100-degree lens with reflective cups for maximum penetration and superb color blending. Utilizes Cree XLamp, XT-E & XP-E LED chips. Input Voltage / Current - 4.5A/115VAC - 2.5A/230VAC. Output Voltage / Current - 36V 5.9A. Weight - 2kg (4.4 lb). &###xA0;Pictures of DOA must be Recieved within a hour of Package Arrival. We will Replace DOAs on next order. Customer Has to be home/business to recieve Live package - No exceptions. In case of any damages please notify us asap so we can help you file a claim with the carrier. If you do not recieve your package please let us know we will help you track it down or locate it. No exceptions or excuses, no credit without photo. We package All products with bubble wrap and styrofoam. Any product you return must be in the same condition you received it and in the original packaging. 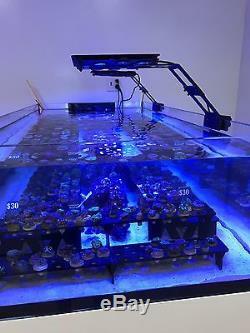 Features: Covers a 24" x 24" area with corals or 30" x 30" for a fish-only aquarium 5 programmable color channels plus integrated dawn to dusk, photo-period profiles, weather modes plus many more enhancing features Channel A Cool White Channel B White Channel C Blue Channel D Royal Channel E Super Programmable RGB color LED fan for aesthetic back-light effect Advanced crossflow fan draws air from above and below the fixture. Pictures of DOA must be Recieved within a hour of Package Arrival. Customer Has to be home/business to recieve Live package - No exceptions Dry Goods In case of any damages please notify us asap so we can help you file a claim with the carrier. DryGoods We package All products with bubble wrap and styrofoam. Any product you return must be in the same condition you received it and in the original packaging. The item "2x MAXSPECT ETHEREAL 130W LED AQUARIUM LIGHT MASTER WITH One CONTROLLER ICV6" is in sale since Wednesday, October 18, 2017. This item is in the category "Pet Supplies\Fish & Aquariums\Lighting & Bulbs". 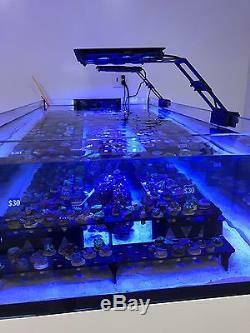 The seller is "reefspecialty" and is located in Southlake, Texas. This item can be shipped to United States, Canada, United Kingdom, China, Mexico, Germany, Japan, France, Australia, Russian federation, Denmark, Romania, Slovakia, Bulgaria, Czech republic, Finland, Hungary, Latvia, Lithuania, Malta, Estonia, Greece, Portugal, Cyprus, Slovenia, Sweden, South Korea, Indonesia, Taiwan, Thailand, Belgium, Hong Kong, Ireland, Netherlands, Poland, Spain, Italy, Austria, Israel, New Zealand, Singapore, Switzerland, Norway, Saudi arabia, Ukraine, United arab emirates, Qatar, Kuwait, Bahrain, Croatia, Malaysia, Chile, Colombia, Costa rica, Panama, Trinidad and tobago, Guatemala, Honduras, Jamaica.